There are many ways how to travel to Thailand. With airplane, bus, train or a boat. 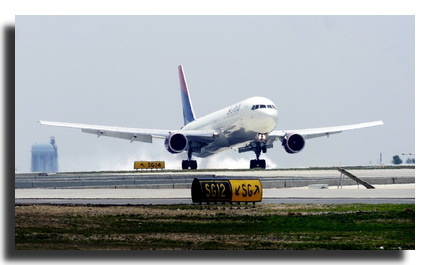 International airports in Thailand can be found in Bangkok, Phuket, Koh Samui, Hat Yai and Chiang Mai. Thailand's border to Cambodia, Laos, Malaysia and Myanmar (Burma) can be crossed by bus, train or a boat. Different ways to cross Thai border come along with different visa regulations. Entering Thailand by plane, your visa is valid for 30 days. Crossing the border with a train or bus overland means to have a 15 day valid visa. For further information regarding visa regulations please contact the Thai Embassy in your country or your travel agency. The transport infrastructure of Thailand is very well developed. Transportation is cheap and it can be very exciting to travel around Thailand in different and colourful vehicles. All major destinations in Thailand can be reached easily and safe by buses, boats, trains or airplanes. On the way you can enjoy the beautiful countryside of Thailand. There are always many alternative ways to reach your destination, also last minute. Many Thai airlines fly to small and big provincial cities. 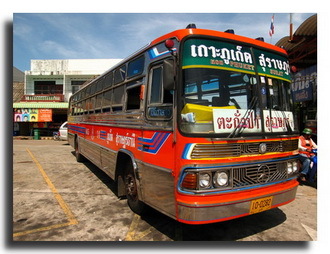 Trains drive to almost every region in Thailand and long distance buses connect all major cities and tourist destinations with each other. Public transport in Thailand is on time. You can rely on the schedules of airplanes, trains, buses and ferries. Wherever you are, in the country or on one of the islands, there is always a choice of transport. For example: Public buses, tuk-tuks, taxis, boats, motorcycles and rental cars. In Thailand you are not looking for the transport, the transport is looking for you. There are 6 international and 24 domestic airports in Thailand. Domestic flights are processed by Thai airlines like Thai Airways, Bangkok Airways, Air Asia, Orient Thai Airlines (One-Two-Go), Nok Air and SGA Airlines. Trains of the national rail company are cheap and drive to all major destinations in Thailand. The most long distance trains start their journey in Bagkok. There are four different kinds of trains: simple, fast, express, express special and three comfort classes: first, second and third class. Using the buses in Thailand is very easy and cheap. Highways are very well developed. Buses without air conditioning are cheap, but slow. They stop in every small town and also along the road to pick up passengers. Buses with air conditioning are private or government owned. They are faster, more comfortable and stop only in big cities. There are 2 comfort classes in these buses: normal and first class. For long routes to Chiang Mai, Surat Thani and Phuket there are "VIP" buses. They are very comfortable and have a capacity for only 30 to 34 passengers. In all big cities and small villages there are taxis. Most of the taxis don’t have a counter. That's why you should negotiate the price with the taxi driver before the drive begins. There are many taxis in Thailand and very easy to find. Normally the taxi drivers are looking for you and you can find one immediately. Taxis are air-conditioned, cheap and fast. To rent a car in Thailand you have to be at least 21 years old. Rental conditions and prices vary from rental agency to rental agency. Some local car rentals rent cars also to people under the age of 21, but you have to check the insurance coverage and liability limits. Rental costs for cars and jeeps are between 2000 and 3000 baht per day. International car rentals are more expensive, but offer their customers a bigger selection of vehicles. Motorbikes can be rented as cars in all tourist cities. It is not convenient to use motorbikes in Bangkok. Motorbikes cost between 200 and 600 baht per day, depending of their size and model. Experiencing Thailand with a motorbike can be great fun and pure adventure. Imagine how it feels to drive around beach towns, highways and back roads. Always remember to wear a motorbike helmet. In Thailand there are the following car rentals: AVIS, Budget, Hertz, Sixt and many smaller local car rental companies.